I was first attracted to The Golem and the Jinni because of the cover (see my recent Cover Lover post), but the blurb further intrigued me. It combines two genres that I love to read – historical fiction and mythological creatures. The Golem and the Jinni is the story of two creatures of myth – a Golem created out of clay and animated with dark Kabbalist magic, and a Jinni of the Syrian desert, trapped for a thousand years in a metal oil flask. Each of them comes to America with migrants, and must try to find their way while keeping their natures secret. Luckily for them, each has a confidante in their respective ex-pat communities who helps them to integrate into society as best they can. They meet in New York at the turn of the twentieth century and each instantly recognise the otherworldliness of the other. This story is not just about their relationship, but also about the lives of those in the Jewish and Syrian ex-pat communities as well as others who call New York City home. Each has their own story of heartbreak and hope and their story threads are woven into the picture of immigrant life. It was a hard life for those who chose to leave their countries, families and all that was familiar and make a new start in a strange country, but the community banded together to help newcomers, and as long as you brought with you a willingness to work hard, things worked out just fine. These are characters that stay with you after you’ve finished reading – the doctor who was possessed by a demon and cannot look at faces anymore, the coffee shop owner who knows all the business of her customers and oils the cogs of community life, the young heiress who cannot face the life of boredom that awaits her once she is married. As the characters travel through the city of New York, it almost feels like the city is a character in itself. I’ve only been to NYC once for a couple of days, but I could feel the spirit of the city as I read about the Jinni walking the streets and visiting the different neighbourhoods. Throughout the story the subject of religion is brought up at different points – from the Jinni trying to understand why these strange humans would bother believing in a ghost in the sky who grants wishes, to the agnostic Michael re-discovering the soothing sounds of his childhood in the Synagogue. This is by no means a religious story, but the different ways that religion manifests in people’s lives is explored in quite a profound way. The main feeling I took away from the story is that for many people, their faith is a constant – a comforting way to deal with everyday pressures, joys and tragedies. Thankfully, the different religious groups in NYC keep to themselves and there’s no actual religious conflict during this story. The Golem and the Jinni has been compared to quite a few books, such as A Discovery of Witches, The Night Circus, Jonathan Strange and Mr Norrell, but I really didn’t think it was similar to any of those. The pacing is spot on – quite comfortable for much of the story but gradually building with the tension. The romance element is very subtle, almost non-existent in fact, but still quite lovely. Helene Wecker has created a beautiful story full of loneliness, self-discovery and magic. It is a perfect combination of folklore set in a historical setting. I found it very enjoyable and I’ll be looking out for Wecker’s future works for sure. Warnings: Sexual situations (not graphic) but on the whole, quite squeaky clean. 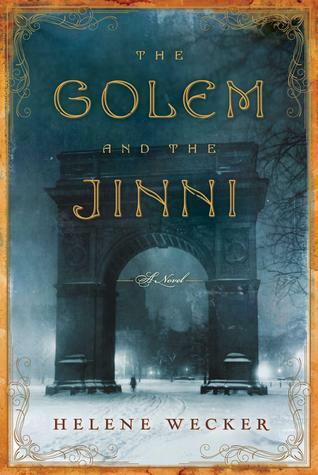 What did others think of The Golem and the Jinni? It’s not out until August here (I was really suprised to see so many reviews already but realised there was a big gap). Definitely one I want to read so good to see you enjoyed it. I’m dying to read this one, now even more so! Requested a copy or my publicity efforts to Blue Door last week but no word yet. Shall keep my fingers crossed. Hannah @ Once Upon A Time recently posted..Do You Remember Discovering Steampunk? Ooh, I hope you get a copy. It’s not coming out until Aug there I believe. Sounds about right. 🙂 Being published by Blue Door here, an imprint of Harper. The Avon lady I talk to directed me to the right publicist so maybe I’ll hear from her/him this week.